Qualities to Look For When Choosing a Personal Injury Attorney | Craven, Hoover, & Blazek P.C. Now that you have decided to pursue a claim, your next step is to hire a reputable personal injury lawyer. There are dozens of law firms to choose from in virtually every town, so it can be overwhelming trying to make a distinction among them all. In order to narrow down the options, you must be on the lookout for certain professional merits in an attorney. Continue reading to learn which qualities separates the seasoned personal injury lawyers from the others. The most important credential to look for in a potential personal injury attorney is experience. Do not rely on your cousin’s son-in law who just passed the state’s bar examination last year to manage your claim. 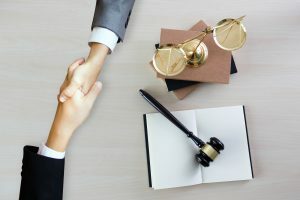 There is a big difference between a junior associate just starting out at a law firm and a seasoned accident attorney with years of hands-on trial and litigation experience. Personal injury law is made up of numerous practice areas, such as workers’ compensation, medical malpractice, nursing home neglect, premise liability, and more. Some personal injury lawyers may only concentrate on car accident claims, while others might provide estate planning legal services. Choose a personal injury lawyer who specializes in the type of accident claim you are pursuing. Keep in mind that it is common for lawyers to specialize in more than one practice area. Another influential factor in choosing a personal injury attorney is how much they charge. Most personal injury lawyers work on contingency, meaning they only get paid if they recover a settlement for their client. Most contingency fees are between 33% and 40%, but this can vary among professionals. Lawyer fees do not include other legal fees, such as court costs, filing fees, and other related legal expenses. These same law firms usually offer free initial consultations as well, so there is no out-of-pocket obligation when first meeting with a lawyer. When you are choosing a personal injury lawyer to represent your claim, it is wise to select one that works with other partners. Although you do not need a huge law firm, it helps for your lawyer to have others around to assist them with investigations or case precedents if need be. Having various resources available is beneficial for the client and the lawyer. The trickier part of choosing a personal injury lawyer is finding one with a personality that makes you feel comfortable. In order to have trust, you must feel like your personal injury lawyer is a good fit for your personal comfort level. Get to know them at your initial consultation to learn more about their practice style and overall disposition, and rely on your instincts when making a final decision. 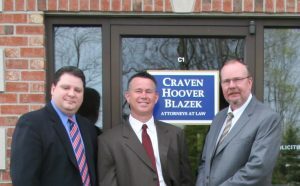 The Law Firm of Craven, Hoover, and Blazek P.C. Call the Law Firm of Craven, Hoover, and Blazek P.C. at 317-881-2700 to schedule a free consultation with a licensed Indianapolis personal injury attorney who can determine the best strategies for your case. Not only does our law firm offer free consultations, we never collect lawyer fees unless we prevail for you! Call 317-881-2700 to get started on your financial recovery, today. This entry was posted in Personal Injury and tagged accident attorney Indianapolis, Indianapolis Personal Injury Attorneys, Indianapolis Personal Injury Law Firm, Indianapolis personal injury lawyer. Bookmark the permalink.